Not available in stores! Your Tour De Coop hat/Helmet accessory! Make the Tour De Coop event more festive by adding a chicken to your bike helmet. Join other “cluckers” and “coopsters” on this years Tour De Coop Event by creating your own helmet accessory! 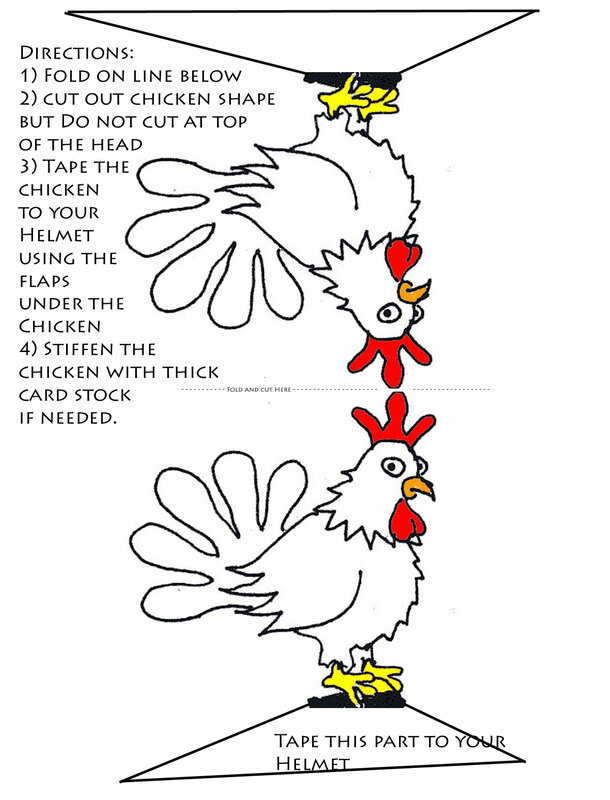 Follow the few easy steps below to construct your own Tour De Coop Chicken Helmet accessory. 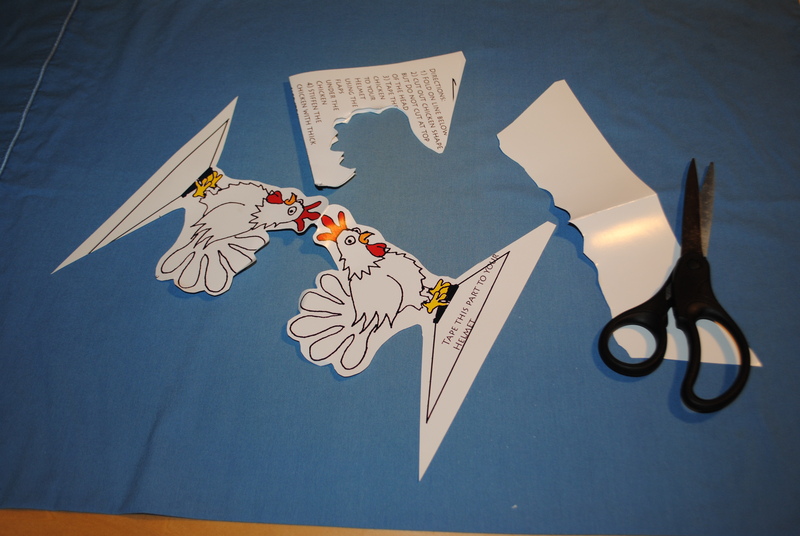 Step 1) Download the PDF Chicken hat flyer and print it out. Step 2) Print out the PDF on color or BW printer. 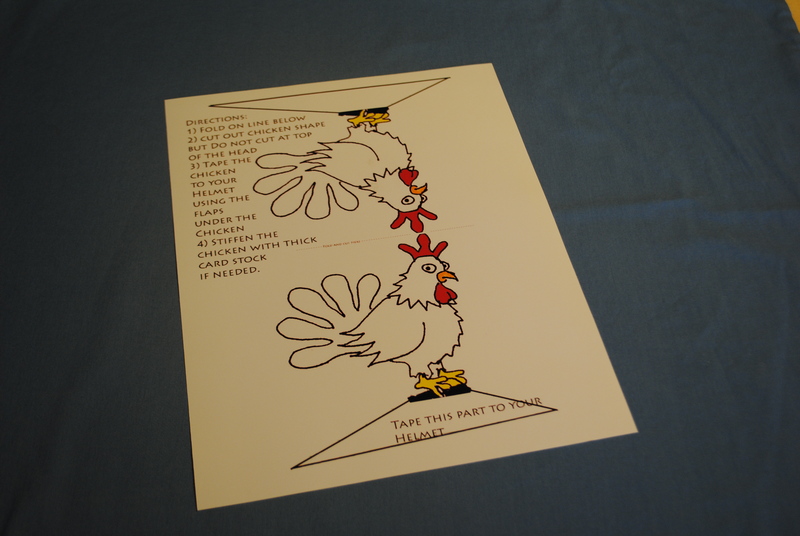 It is best to print to thick paper or card stock if possible or glue to card stock. Step 3) Fold the printout on the area that says “fold and cut here”. Step 4) Cut out the chicken shape but leaving the top of the chicken crop still attached with the supporting tabs below that will be used to tape the chicken to the top of the helmet. Step 5) Cut a small piece of cardboard about 4 inches by 1 inch. 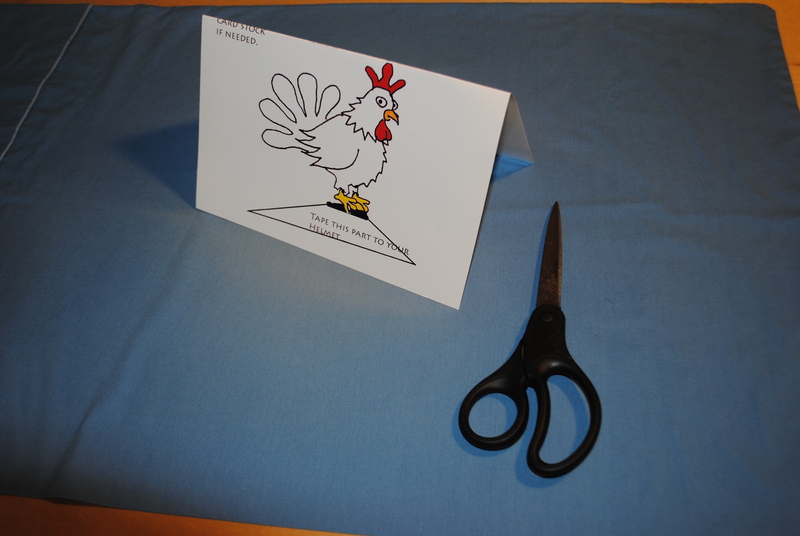 Fold out the supporting flaps, place the cardboard/card stock in the middle of the chicken and tape your chicken together. This cardboard will help stiffen the chicken to stay vertical. Here is a completed Tour De Coop Chicken Helmet decoration to help you fly. 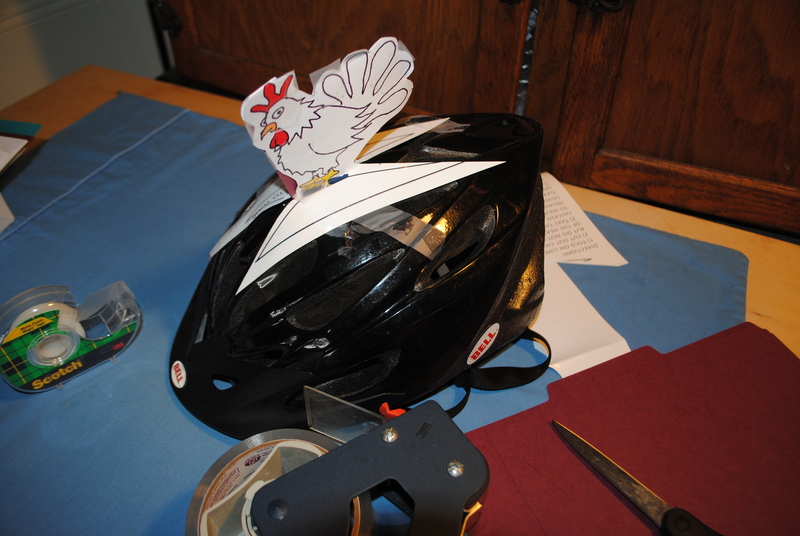 Step 6) Attach your chicken to your helmet with packing tape or scotch tape and start clucking. If you get lost on the coop tour, simply look for other coop tourists with chicken helmet accessories. Cluck loudly to find other coopsters. 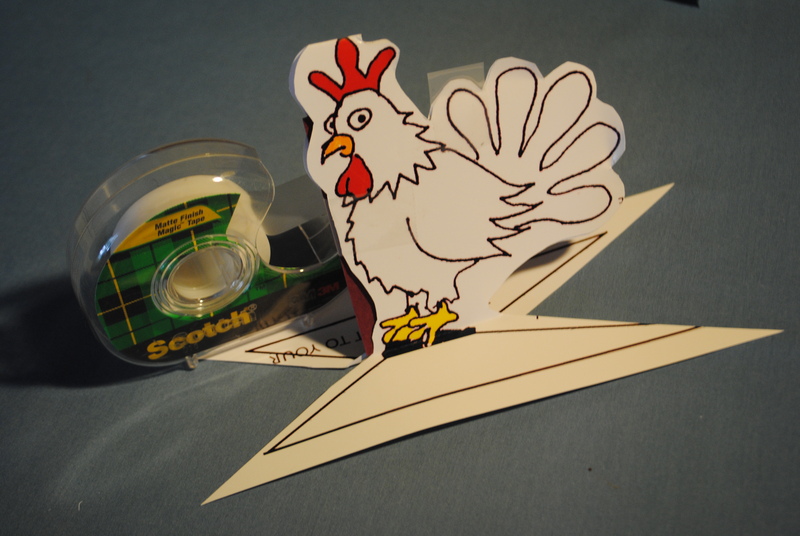 Step 7) Fly and bike the coops better with your newly attached and aerodynamically designed helmet chicken airfoil device. Fully verified independent test studies have shown that coop tour clucking fun performance is enhanced by 34% with the addition of these chicken accessories. It could also be related to the chicken “plumage” factor which has been shown to increase interest in both chickens and humans when additional plumage is displayed such as this helmet accessory. Step 8) The chicken helmet decoration can also be used a post coop tour therapy device. Simply and carefully un-tape the accessory from your helmet and place it on your desk at work or at home. When you need to be reminded of clucking fun times on the coop tour and that good feeling of coop goodness, simply stare a the chicken helmet decoration and remind yourself of the coops and the chicken friends you made the tour and life will seem better.